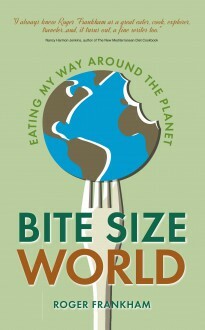 The idea for Bite Size World came from a game Roger Frankham used to play with food-minded friends involving spinning a globe blindfold and throwing a dinner party based on the food of the country where your finger landed. Roger soon realised that a whole world of cuisine was out there that he knew absolutely nothing about. The idea so fascinated him that he abandoned his job and set out on a once-in-a-lifetime tour of the planet, armed with just a suitcase, some phrase books and his palate. Eight months and twenty-five countries later, there had been ‘fifty-three moments when I took a bite of something so amazing that everything seemed to stop around me’, as well as a few experiences he wouldn’t go through again to save his life. They are all in Bite Size World – along with the merely good, the disappointing and the inedible. Anyone fancy rotten Icelandic shark?